Support from the biggest telecom players –Also known as LTE-M2, NB-IoT is backed by the support of some of the top telecom companies in the world. The ball was set rolling back in 2014, when Huawei spent $25 million to acquire Neul (which was already working on LPWAN technologies, along with Sigfox and Ingenu; the LoRa Alliance was formed half a year later). Huawei also partnered with Ericsson to create the NB-IoT standard (which has a DSSS modulation, just like Weightless-W). Vodafone and Qualcomm have also joined in to pull their collective weights for refining this wireless radio technology. 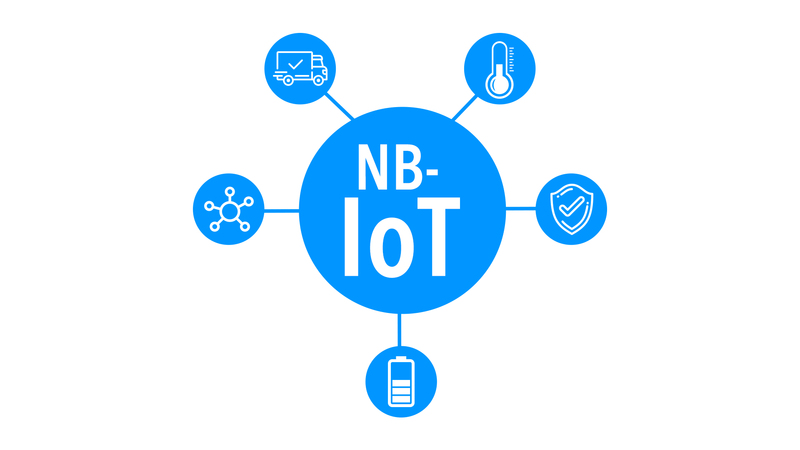 The industry support for NB-IoT is robust, and the technology has every chance of becoming more efficient in future. Note: In 2016, the final specification of NB-IoT was frozen in 3GPP Release 13. 2. Bandwidth requirements – Compatibility with 2G, 3G and 4G (as well as the upcoming 5G generation of applications) is essential for any optimized LPWAN standard. The low bandwidth requirement of NB-IoT (200 KHz) enables it to seamlessly function in conjunction with the existing cellular networks. The 200 KHz bands that have been used for GSM connections previously can be easily used for NB-IoT modules. The technology, on average, ranks high on the reliability count – and can be considered ideal for low data throughputs (both short-range and long-range). NB-IoT can support approximately 200 Kbps of downlink and uplink traffic rates. 3. The cost factor – In comparison with full-fledged LTE-M1 resource gateways, NB-IoT components are much more reasonably priced. That, in turn, has shifted the attention of OEMs to chipsets that support only narrowband IoT (instead of being compatible with LTE standards as well). Silicon is being used by many of the manufacturers to create these NB-IoT chips. With increasing demand levels, 3GPP expects the unit cost of NB-IoT modules to fall to $5 or less – which will be a significant achievement. However, at the LPWA World Conference in May, it was announced that the average cost for NB-IoT currently hovers in the $11-$16 range, which is too high to be of any practical interest for enterprise customers. The technology is not expensive per se, but the cost figures need to come down further. 4. Excellent coverage – One of the most important attribute of any LPWAN standard is its overall coverage area, and NB-IoT comes up trumps in that regard. The average coverage of a properly functioning NB-IoT resource block is close to 22 kilometers, comfortably higher than both LoRa technology (14-15 kms) and Sigfox (16-17 kms). There is an added condition though – the connectivity has to be uninterrupted and strong enough, to allow NB-IoT reach remote, relatively difficult-to-reach locations. In an ideal environment, the 3GPP standard can deliver almost 20 dB more coverage than general GSM networks and can deliver top-notch penetration (e,g, through walls, metal surfaces, etc.). With advanced repetition and Power Spectrum Density (PSD) boosts, NB-IoT has the capability to be 10X more efficient in terms of coverage, than other comparable LPWAN technologies. Link budgets are also higher, while bitrates are better as well. Note: Unlike LTE-M1 (also by 3GPP), the NB-IoT standard does not function within a LTE construct. 5. Enhanced security – Both Sigfox and LoRa technology have been in existence for some time now, and have their own high points – but both of these technologies have one potentially serious drawback. They use unlicensed spectrums for data transfer and communications, which means that the security of the devices and the network remains rather suspect. In contrast, NB-IoT uses licensed spectrums. While there are additional costs involved for purchasing licensed bands – the greater security standards boost the viability of NB-IoT to global users (enterprise users in particular). Usage of licensed spectrums helps in pulling up the reliability of the technology as well. 6. Deployment modes – The NB-IoT standard can be deployed in three different ways, to establish a channel for low-power, infrequent data communication/transfer. In the standalone deployment scenario, new bandwidths are used – and support is extended to LTE/UMTS as well as GSM. The technology can be implemented in a Guard Band, where the existing bandwidths within the underlying LTE network are utilized. The final (and least popular) deployment mode for NB-IoT is in ‘In-Band’, in which the LTE carrier’s resource blocks are made use of. In terms of indoor coverage, standalone and guard band deployments are way more efficient than the In-Band application of NB-IoT. 7. Number of connections supported – The most important objective of LPWAN is to move towards the ‘Internet of Everything’ – with more and more connected devices being used in every household. That, in turn, makes it critical for any radio technology to support a large number of connections (in each cell). In an NB-IoT framework, more than 50000 devices can be connected per cell (the number, in select scenarios, can move northwards of 100,000), ensuring massive gains in terms of smart connectivity and better prospective use cases. In IoT applications that typically require low bandwidth (for instance, smart water meters), the enhanced connectivity of NB-IoT is a major advantage. Note: The bi-directional data transfer via NB-IoT has less interference than most other LPWAN technologies. Global roaming features are available too. 8. Minimal power consumption – Just like LoRaWAN, NB-IoT also places very low power requirements on the system. Presence of the enhanced discontinuous reception, or eDRX, is an important factor – and power is shut off at all times except when data is being sent/received. Since NB-IoT has a simple, basic waveform, the power requirements are further lowered. All these factors, in turn, ensure that the battery life of NB-IoT can extend up to 10 years, on a single charge. On average, the deployment coverage of NB-IoT/LTE-M2 is significantly higher than that of LTE-M1 applications. 9. Use cases of NB-IoT – A full NB-IoT network will be rolled out in New Zealand in the first half of 2018 (as announced by Vodafone NZ earlier this week). One of the biggest advantages of this technology is its suitability in a wide range of industrial applications (anything that require low throughputs and works well with moderate latency (~10 seconds)) – ranging right from smart gas and water meters, smart waste disposal, and smart parking devices/sensors, to smart buildings and alarms (including predictive maintenance tools), pollution level tracking, and smart agriculture. On the consumer applications front, person tracking as well as goods tracking can be done with the help of NB-IoT. The technology easily overcomes the range limitations of most other LPWAN tools, and provided that the signal strength is fair enough, delivers high-quality data transfer services seamlessly. Note:SARA-N2, by u-blox, is said to be the very first NB-IoT module. It was launched in June 2016 and it supports uplink and downlink rates of 21 Kbps and 227 Kbps respectively. 10. Availability of frequency bands – For effective indoor coverage and reliable penetration levels, low frequency bands are typically found to be more effective. In fact, that is one of the main reasons behind the widespread use of the 900 MHz band by telecom operators globally (mostly for GSM networks). Now, NB-IoT is mostly deployed in frequency bands like 800 MHz and 900 MHz (700 MHz bands are also used) – and that is an advantage, since there are no dearth of commercial networks (LTE) that already operate on these frequency bands (particularly 900 MHz). By 2015, there were as many as 14 such networks – and the number has only grown since then. These low frequency spectrums have solid ecosystems, and that works in favour of NB-IoT. 11. Device complexity – In terms of both cost as well as device complexity, NB-IoT ranks ahead of GPRS and GSM networks. As already mentioned above, the waveforms are simpler as well. Even so, there remains certain challenges on this front. Perhaps the biggest challenge is the non-availability of ubiquitous 200 KHz spectrums (required for NB-IoT) across countries. To tackle this issue, additional features and capabilities have to be built into the antennas and the system modems/routers/gateways. There can be some IPR risks (intellectual property risk) involved as well, due to the licensing costs. 12. NB-IoT as a service – The LTE-M2 radio technology standard has all the capabilities to deliver carrier-grade communication solutions. It compares favourably with practically all other LPWAN platforms in terms of security, reliability, coverage, support for connected devices, integration of big data tools and applications, and even billing procedures. Cloud-based service provision standards and smooth network virtualization are among the most important IoT trends at present – and ‘NB-IoT as a Service’ offers complete support for both. There can be some problems regarding deployability (since NB-IoT is not a part of LTE, thereby necessitating the use of side bands) – but on the whole, it has every potential to become a leader in the LPWAN domain in the next few years. A Huawei five-year forecast put the estimated revenues from NB-IoT applications in Germany at a whopping $1.67 billion – with smart city applications and smart logistics/automotive systems right at the forefront. The US market, on the other hand, paints a contrast – since AT&T and Verizon are invested in LTE-M1, and the overall demand for NB-IoT is likely to remain low. The main reason for this is the fact that NB-IoT is not based on LTE. From our analysis, it can be concluded that 3GPP’s NB-IoT is, arguably, the most powerful LPWAN tool – at least on a theoretical level. Practically though, there are a few points of concern, with Huawei and Ericsson reporting problems in the interoperability of their narrowband services. In several major European markets (Netherlands, Ireland), NB-IoT has missed its proposed rollout dates – opening up opportunities for competitors like Sigfox and LoRa. Vodafone’s plans to ‘crush’ LoRa and Sigfox with NB-IoT have been put to the back-burner for the time – and all eyes are now on how the lingering issues with the technology can be ironed out. It remains to be seen whether NB-IoT, an otherwise excellent LPWAN-tool, can indeed become as successful as was once expected.